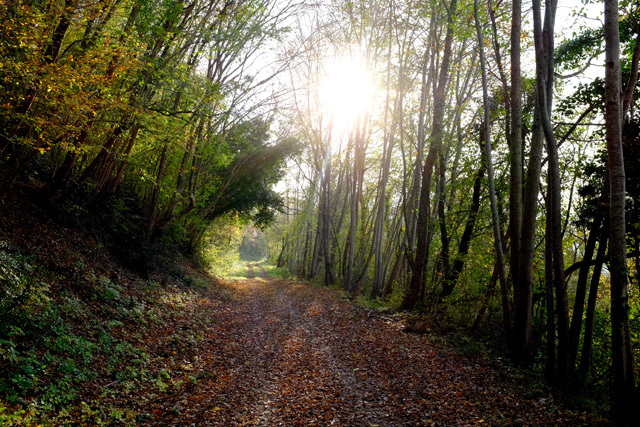 The first day of November was a perfect sunny Autumn day: perfect for walking the second leg of the Parenzana trail from Buje to Livade. I had cycled the section from Muggia to Buje just a few weeks before. 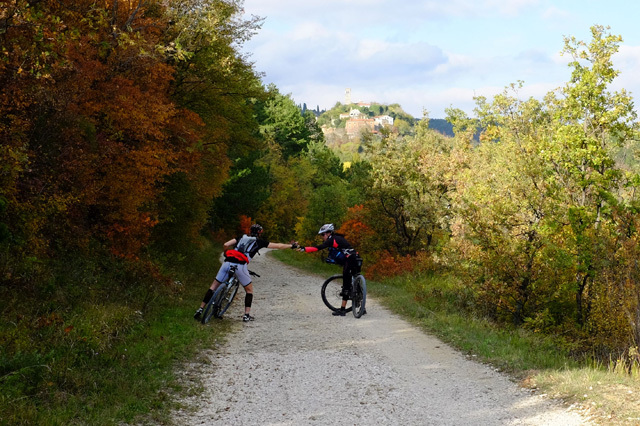 That was a delightful ride that started in Muggia, Italy before quickly crossing into Slovenia where the path followed the coastline before turning inland. 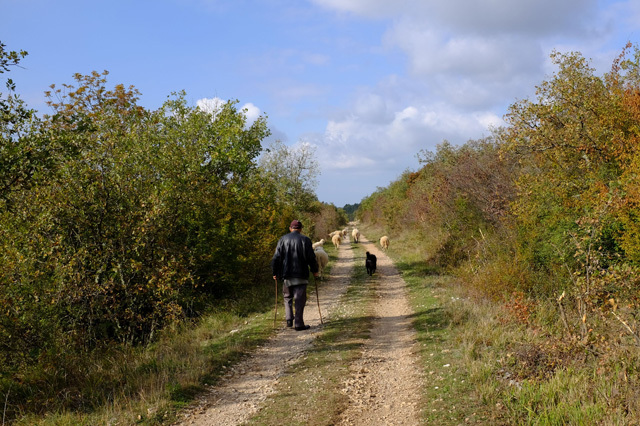 The path then continued through vineyards and olive groves before descending to the salt pans of Sečovlje, and crossing the border into Croatia. 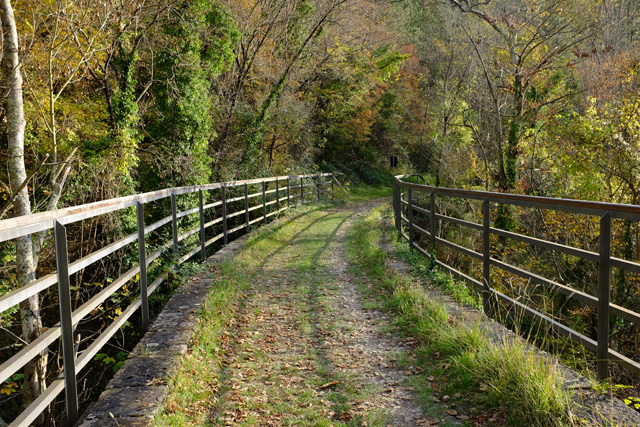 But I was certain that this next stretch of the Parenzana (a trail that follows an abandoned railway line) would be the most scenic because it runs through a landscape of rolling hills and passes through several picturesque hilltop villages. So I decided that I would walk this section solo from Buje all the way to Livade, taking in all the gorgeous scenery on the way at a leisurely pace. 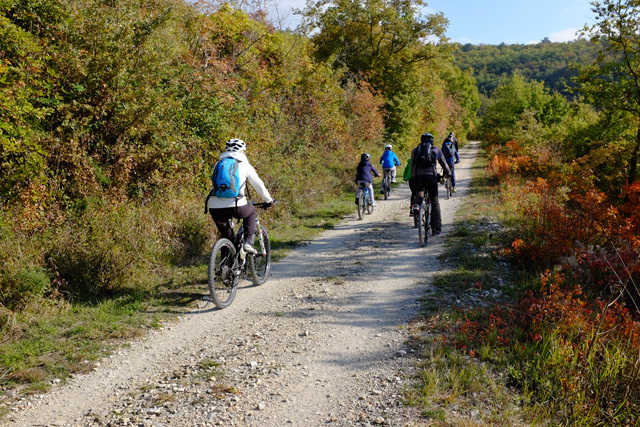 I started off at a good pace from Buje, where a family of Slovenian cyclists were also joining the trail. This first stretch was a bit underwhelming because it passed initially through some forest, and then I only saw shrub-land on each side of the trail and no views at all, the whole 1.5 hours it took me to walk to Grožnjan. On the way, I passed only a herd of sheep and their shepherd, while many cyclists whizzed past me. I was the only walker. Once I reached Grožnjan's old abandoned railway station, I knew the scenery would be less monotonous from here on. Already there was a beautiful sweeping view from this hilltop position of the medieval town and its church spire, terraces of olive groves and vineyards, and the Adriatic Sea glistening in the west. Grožnjan is the highest point of the 123-km-long trail, at 293 metres. After my lunch break I was back on the trail. Several cyclists went by on their mountain bikes, including an Austrian couple I had met earlier on the trail when I had stopped to read one of the information signs that mark each spot where a train station once stood. I was glad I was walking, because the views on this stretch towards Završje were truly stunning. The next section of the trail is mostly through forest, with lots of impressive viaducts on the way. There were also a few tunnels, with Freski being the longest at 143 metres. It was also pitch dark inside so I was glad I had a flash light with me. The information sign at Oprtalj revealed that the section of the railway here was a difficult one with many sharp bends and that the train had to slow right down to 10km/hour. Failure to comply to this speed restriction led to an accident in May 1923 with the train operator losing his life. 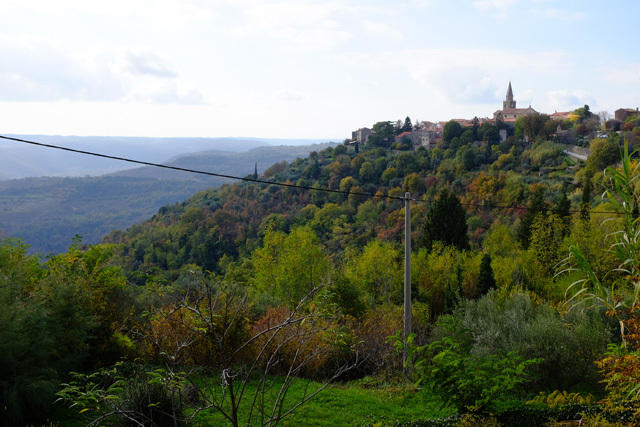 After a long walk that descended through a dense forest I finally reached the Mirna Valley and saw Motovun in the distance. I ended my walk in the town of Livade, where there's a Parenzana Museum. It was closed when I arrived, but I'll surely visit another day. 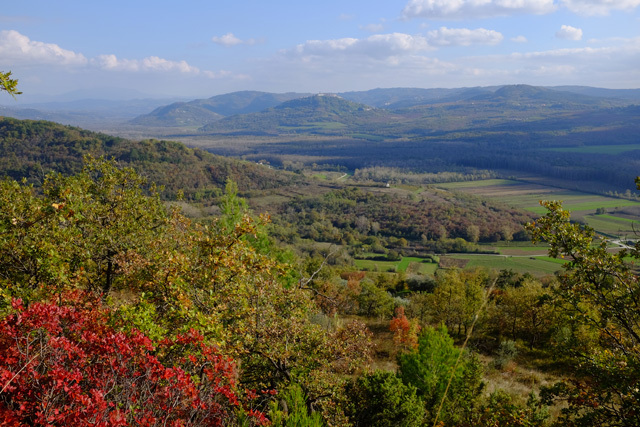 The walk from Grožnjan to Livade is definitely the most scenic part of the Parenzana trail. It's also relatively easy because it's all downhill. For people who don't have a lot of time and would like to cover just a section of the trail, I would recommend starting in Grožnjan and finishing in Oprtalj. 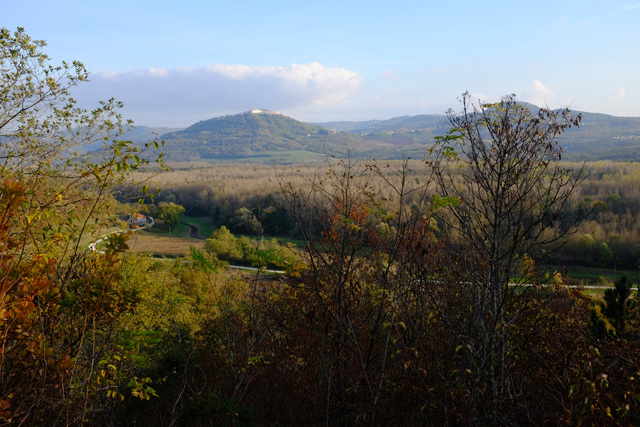 Next I'll be covering the distance from Livade to Vižinada – again on foot!